The Hudson Valley Community College Foundation named the Troy-based McCarthy Charities as the recipient of its 2018 Outstanding Philanthropist Award. Representatives from the Charities accepted the award during the college's annual Leadership Donor Reception on Wednesday, Sept. 12 at the Franklin Plaza Rooftop Terrace in Troy. The Outstanding Philanthropist Award is presented annually to an individual, couple or family foundation that has shown exemplary leadership through charitable giving to Hudson Valley. The McCarthy Charities has been helping the Rensselaer County communities for more than a century. Founder Peter McCarthy, born in Troy in 1845, grew up the son of poor Irish immigrants, but went on to become a successful businessman, industrialist and philanthropist. In 1917, two years before his death, he founded the McCarthy Charities to ensure that his mission of helping others would live on. One hundred years later, the family foundation is still focused on improving the quality of life in Rensselaer County. Their generous contributions have benefitted many community organizations and institutions, including generous gifts to the Hudson Valley Community College Foundation. Their support has provided scholarships for adult learners and tuition support for children from low-income families to the college's summer camps. Most recently, the college reached out to the Charities to fund Second Chance Scholarships for students who not only have financial need, but have also overcome tremendous personal obstacles in order to pursue their education. 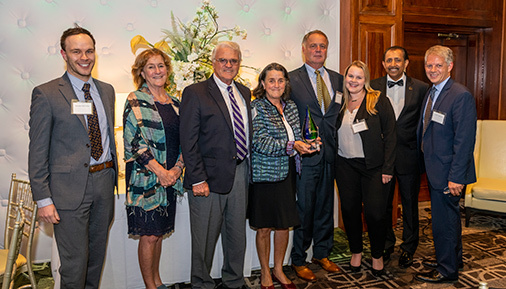 "The Foundation is honored to recognize the McCarthy Charities for their generosity with the 2018 Outstanding Philanthropist Award," said Foundation Executive Director Regina Scarano LaGatta. "This organization has provided incredible support for our students, including scholarships for adult learners returning to school and funding for "Kids on Campus" summer camps for children whose families could not afford the program otherwise. They have truly helped create a brighter future for so many students and community members, and it is our pleasure to recognize them with this award." The McCarthy Charities is the award's fourth recipient since its inception three years ago. The first recipient, in 2015, was former Foundation Board Chairman Gordon Zuckerman; the 2016 recipient was Doug Baldrey, a former professor at the college and Foundation Board member; and the 2017 recipient was Peter Marx, president of local construction company U.W. Marx, Inc. and a longtime supporter of the college.